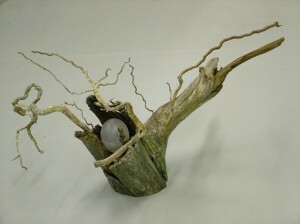 Musick | Pat Musick is a Vermont artist who has exhibited her sculpture, paintings, works on paper and drawings throughout the United States, Europe and Mexico. Downsizing a studio suggests a sale, and that is exactly what will take place the last weekend in August and Labor Day weekend in September 2018. 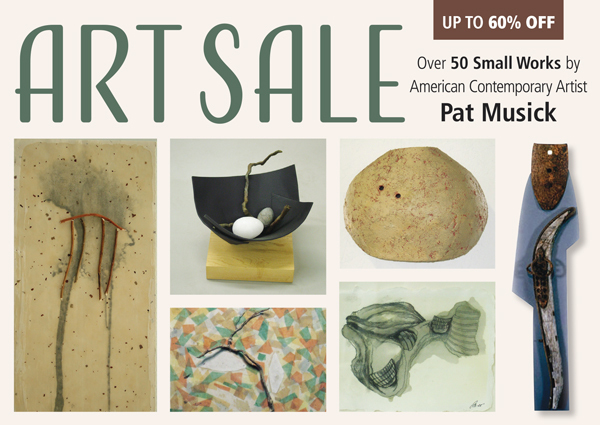 Over 50 of Pat Musick’s small works will be offered for sale at drastic discounts. 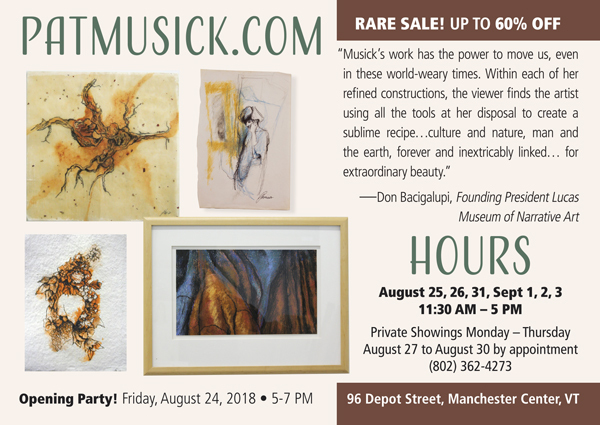 Paintings, drawings, sculpture, collage and books by the artist will be available at 96 Depot Street, Manchester Center, VT (across from Eddie Bauer). An opening event will take place from 5-7 on Friday, August 24th. Works were created over a 55 year period, so there is historic value. 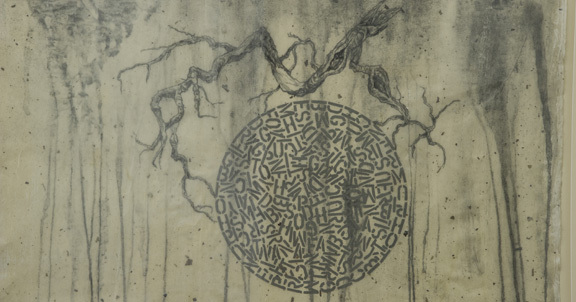 Subjects represent her entire oeuvre, including the time she moved from 2-dimensional paintings and drawings to 3-dimensional wall and free standing sculpture. moment of mystery and promise. How many trips to Italy start that way? 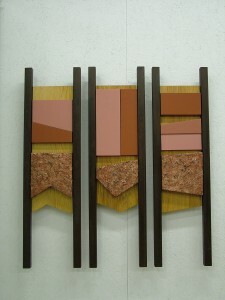 It was 1962 when I first encountered this great love in the Stirling and Francine Clark Art Institute in Massachusetts. 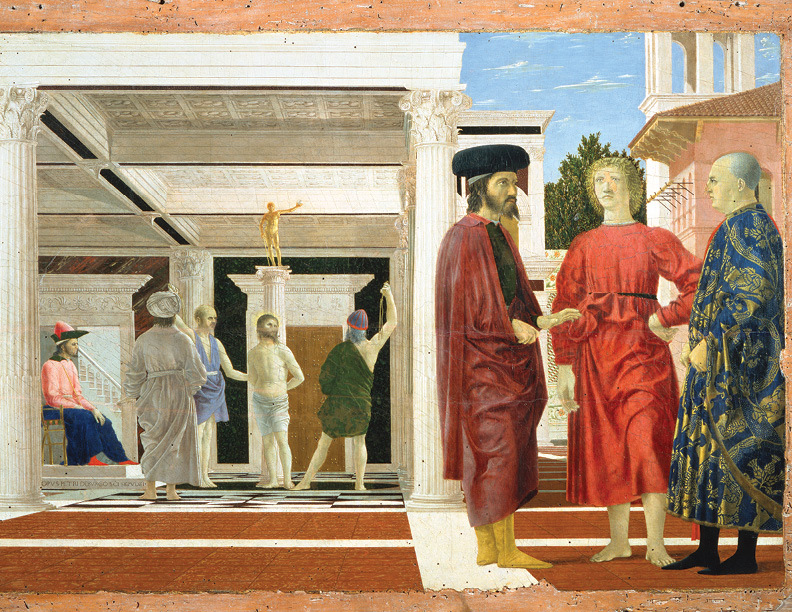 Piero della Francesca, the great Renaissance painter, invited me to travel Italy on an unforgettable trip that lasted for forty-five years. 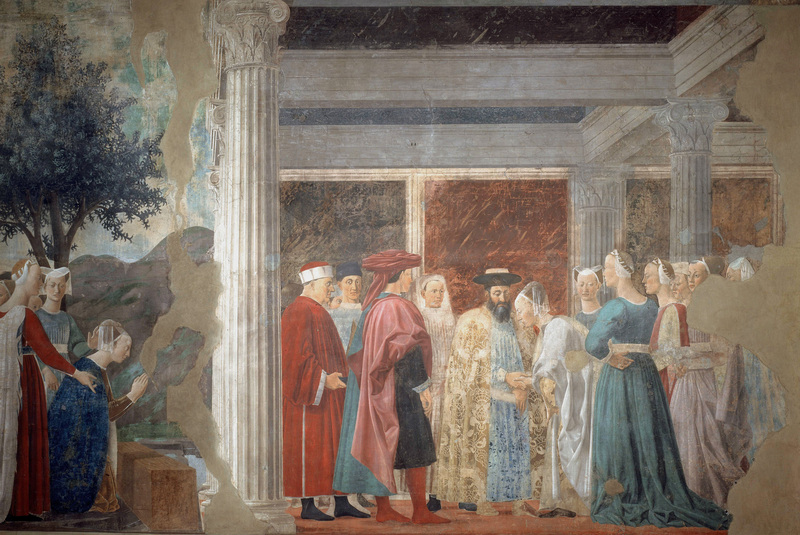 I would like to share that adventure with you, a journey along the Piero della Francesca Trail. In my book The Piero Affair…with sidetrips you will find a view of Italy not often discussed in the guide books as you go back and forth between ancient Tuscan churches and little known , uncrowded destinations of today. 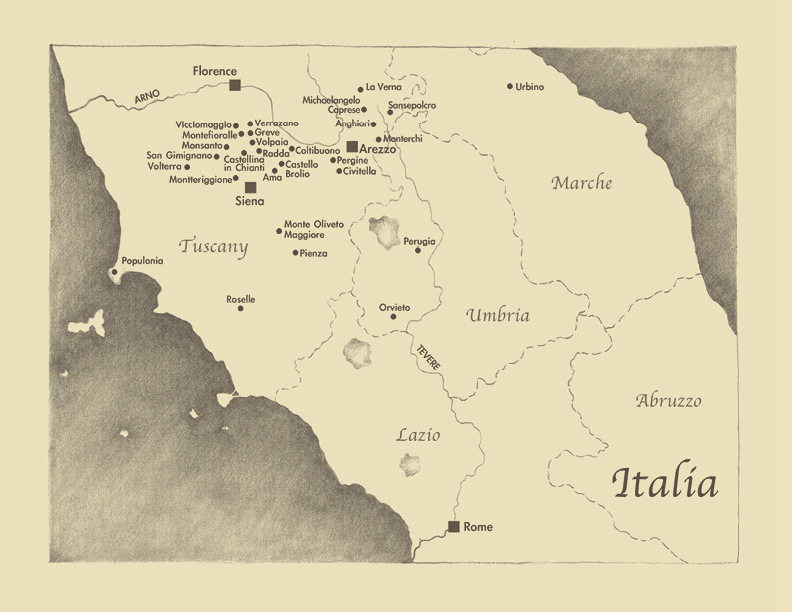 The PdF Trail, for me, starts in San Sepolcro, Piero’s birthplace. In the Museo Civico you will see two of his masterpieces…the Madonna Misericordia and The Resurrection. From there you will journey to Urbino, Perugia, Monterchi and finally Arezzo to see his masterpiece in the Church of San Francesco. In between these rendevous you will find the wonders of Florence, the Tuscan seacoast at Populonia, Etruscan ruins at Roselle, Castles at Brolio, Meleto and Volpaia, wonderful wineries and fabulous food at Monsanto and Coltibuono, a village butcher shop at Greve, Renaissance festivals and local markets, a ravished village from World War 2, jazz concerts in small cellars, and everywhere the amazing Italian people who remember and love the Americanos! The Piero Trail begins in Sansepolcro, his birthplace. 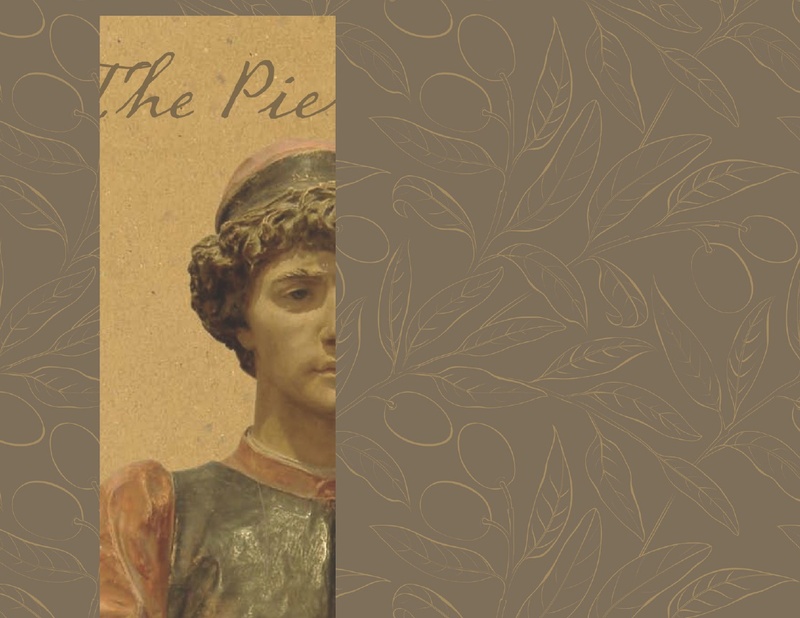 Aldous Huxley called The Resurrection, “ the most beautiful painting ever painted.” It contains the Piero eyes that one finds in all of his faces. Since artists are well known for including their own likeness in their works, I assume these are Piero’s eyes…the ones with the message for me. Sit for a time before this work, for it contains much that is typical of Piero’s work, expressions at the heart of a love affair. Soft color caresses you, the texture tantalizes you, the simple forms seduce you. The second stop on the PdF Trail is in Monterchi, a small village that was Piero’s mother’s birthplace. 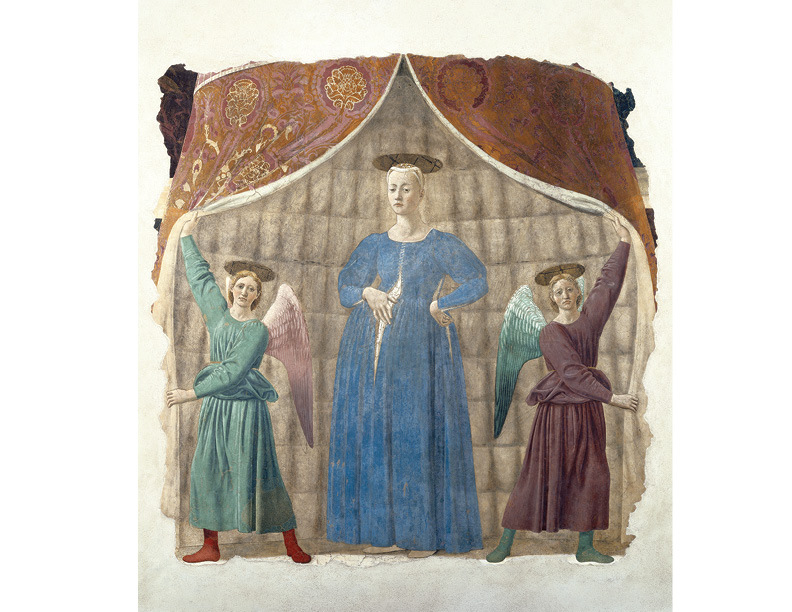 Here is the work that is the most important to me, The Madonna del Parto. Twice the sole remaining structure following earthquakes, it was finally housed in its own quake-protected building. You enter a small dark room and she faces you. Two angels part the curtain and tell you. “Ta da! She is here.” One of only three Marys painted as pregnant her strong figure takes your breath away. The shimmering glow of creation fills the space. And then, again there are the eyes. Cast down, they still manage to engage the viewer and they speak. I cannot tear myself away. I am definitely hooked. From Monterchi, journey to Perugia. Grab some of the delicious chocolate for which the city is famous, but only after you have visited another beautiful Madonna,. This one is crowned by one of the most heavenly Annunciations that I have ever seen. 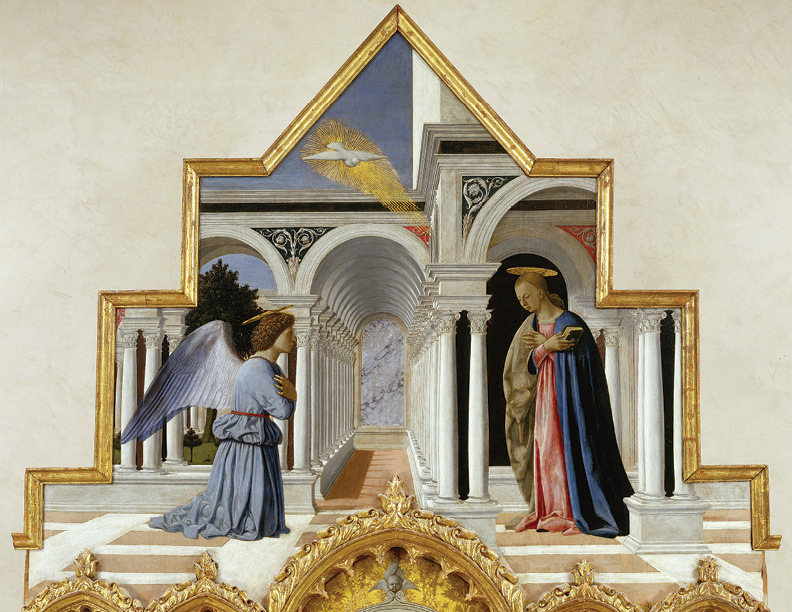 This is such a perfect example of Piero’s sense of receding space…the geometry he pioneered in the fifteenth century. 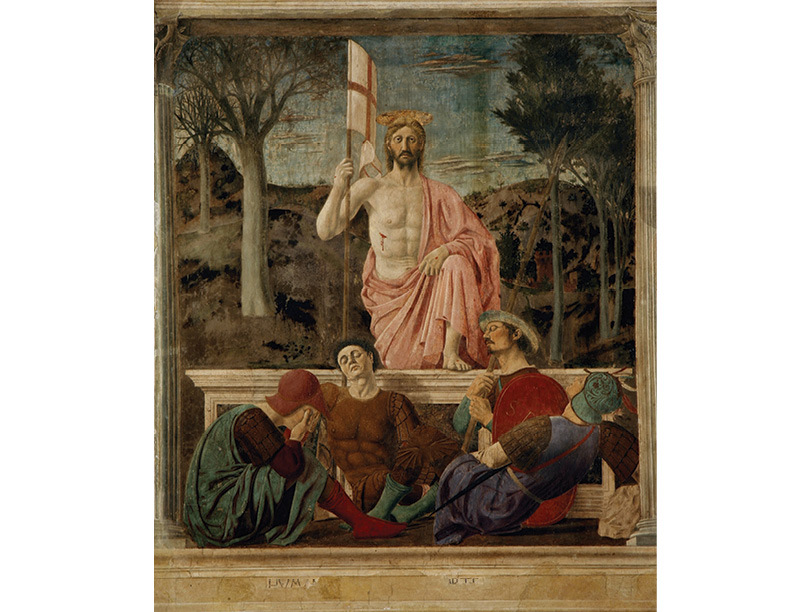 It is from Piero that such artists as Michelangelo learned perspective. The arched hallway recedes into the actual wall, and draws me down the loggia into further involvement. Journey on to Urbino over the most precipitous guardrail-free road in Italy. Just a preparation for Urbino’s streets that go straight up, and of course the museo is at the top. Here are two Piero’s. One, Flagellation, is noted as his “most mysterious.” There are many interpretations of the meaning of this painting with its confounding perspective and mysterious religious allegory. One explanation is that the two men on the right each lost an adored son whom they likened to Christ (notice the similar stance.) The two stories are definitely connected through the continuing floor pattern and the architecture behind the man in the black hat. Notice how the conversation is carried on by the eyes. A little mystery is good for any romance. Your final stop on the Trail is in Arezzo in the church of San Francesco to see the huge fresco The Legend of the True Cross. This work is considered by many to be Piero’s masterpiece. It tells the story of the apple tree planted in the dead Adam’s mouth that grows into the cross upon which Christ is crucified. Two Queens intervene in the travails of the cross, and it is the source of victory on at least one battlefield. My favorite panel is The meeting of Solomon and the Queen of Sheba. This work glows with an unearthly beauty. Being the feminist that I am, I like the fact that even though Sheba is bowing, she makes it obvious she is not “lowering.” It is said that Piero painted some of the strongest women in art history. I like strong! Well, in case you feel you have finished a course in Italian art I’ll give you an A (Forgot to tell you, I am a professor). Not to worry, there is so much fun to be found in the side trips we take between trysts with Piero. I leave it to you to follow him in more depth, and learn his secret message in the final chapter of my book. Arezzo is just twenty minutes from the house where we stay in a hill-top Tuscan village called Pergine.We do a lot of cooking there. My family loves to cook, and when we are not eating the delicious Tuscan cuisine in some trattoria or other, we are cooking at home. Or perhaps we are taking cooking lessons from Andrea at Coltibuono, who taught me to make vegetable soup the professional way, with the “r” rrrrolling. We love wandering the small 11th century stone village where we have become friends with Marta, Marina and Francesco, Giulio, Irena and Eduardo . We visit the small church, mini pharmacy, two bars, the butcher, and green grocer. From Pergine we journey out every day to brave the world of Italian roadways and drivers and seek out new, unknown places where sometimes we are the only people. On these side trips you will unearth the joy of Tuscan wines, especially Chianti and Brunello. We spend a lot of time discovering good wine. It is a very important part of traveling in Italy. There is a great little farm at the foot of our hill, Migliarina. We buy our table wine from them. We take a large bottle, dama, that holds five liters, and they fill it up with a gasoline type hose and nozzle. We also purchase their olive oil, some of the best in Tuscany, and very good grappa. We buy our vegetables fresh every day from Marta. Italian vegetables are exquisite. We get our eggs, meats, cheese (the local sheep cheese,pecorino is to die for) from the butcher. But we do not ignore the gigantic super market in town, the Iper Coop, for they have the best gelateria in the area. Rainy days we sit and read, catch up on our email and cook, take a stroll when it is not showering and enjoy la dolce vita. To order the book The Piero Affair…with side trips visit www.camusart.com click on books. When you are through with the book, please drop me an email at camus@camusart.com and let me know if you fell in love too! Ciao! Images are from The Piero Affair…with side trips, with permissions from Museo Civico, San Sepolcro, IT and Art Resources, New York, NY. Copyright. 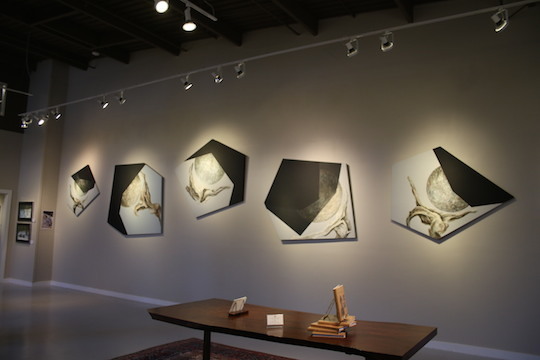 On November 28 Lisa Helmholz and the Helmholz Gallery in Manchester Center hosted an exhibition of Pat Musick’s series Tertium Quid. The showing was a farewell to the artwork before it journeys to the Kennedy Space Center in Florida to join the NASA Permanent Collection which includes such names as Warhol and Rauschenberg. 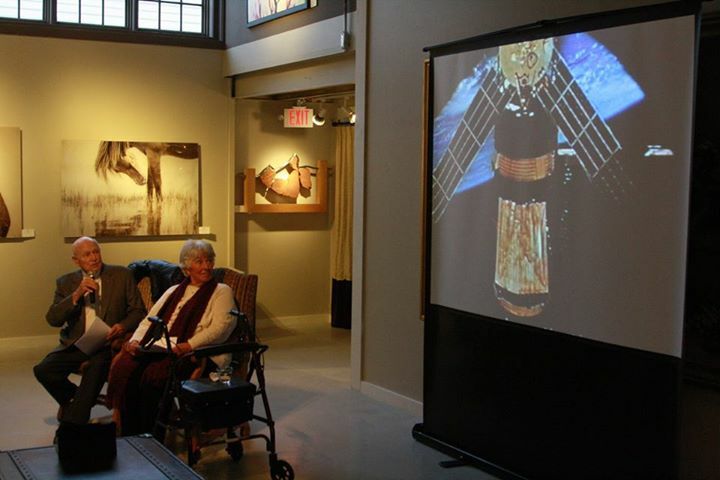 Pat and Jerry did a presentation for about 100 guests at the Gallery and Carr showed a videotape of his mission which took place in 1973-74. 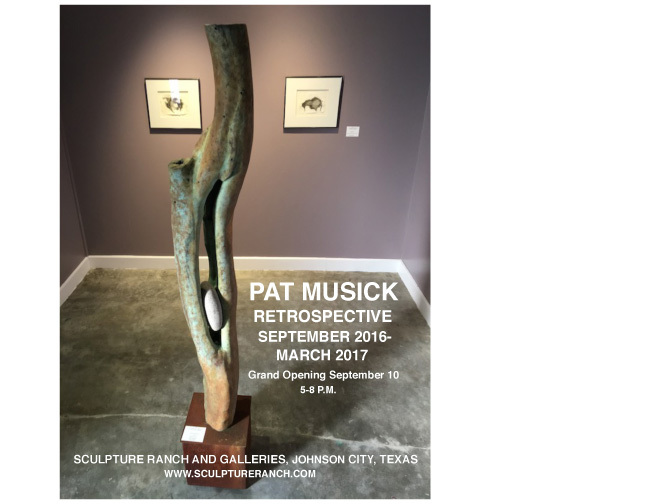 The stretched canvases were made for Pat by her first husband, Jack Musick, then head coach of football at Cornell University. 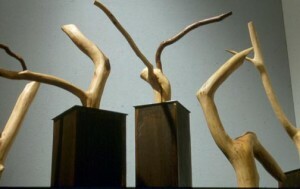 Photo of the series by Mindy Musick King. Photo of the Gallery presentation by Andrew McKeever. 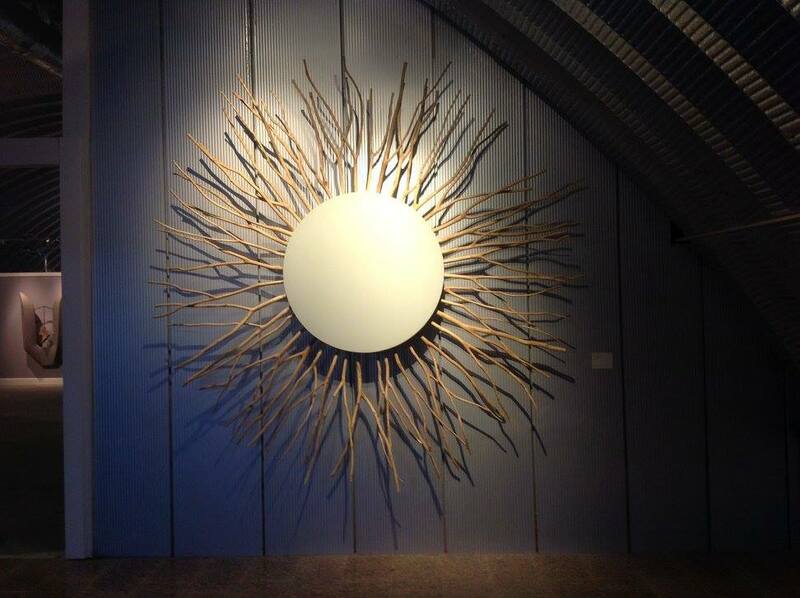 Pat MUsick’s large wood and steel sculpture entitled Hallelujah! 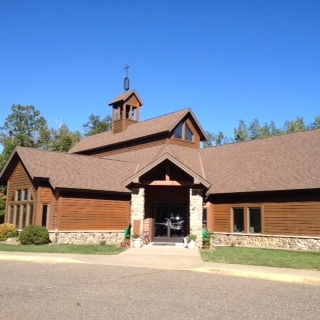 has found a new home at the Crosslake Presbyterian Church in Crosslake, MN. The work, that Pat created in 2000 consists of five elements varying in height up to nine feet. They were inspired by the gospel choirs which she heard on frequent visits to New Orleans when she lived in the South. Hallelujah! is a gift from Ronda Hopkins, member of the Crosslake Presbyterian Church. Her generosity makes possible the placement of the piece. 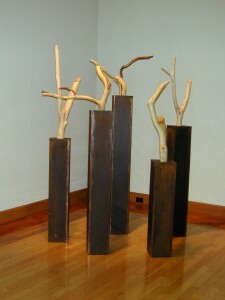 The sculpture’s interesting abstract interpretation fits the beautiful simple, rustic and minimal architecture of the church building. 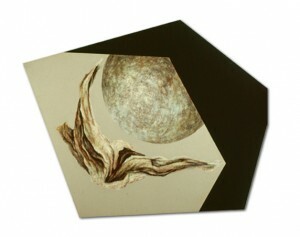 Pat Musick’s five paintings titled Tertium Quid which have been accepted into the NASA permanent art collection will soon be shipped and on their way to their new home. But before they leave Vermont they will have a two week showing at the Helmholz Fine Art Gallery in Manchester Center, VT. In 1970 Pat Musick, responded to our expanding exploration of space,with concern that, as we moved into outer space for longer periods of time, we might change in many ways and wondered what this evolution might look like. 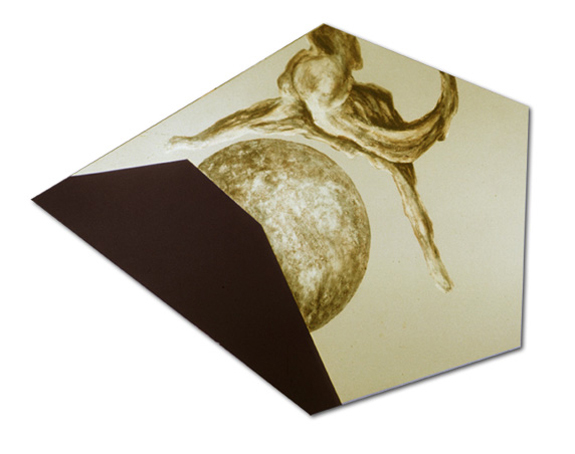 The result was five stunning paintings that she titled Tertium Quid. (This is a Latin expression that means “a third thing that is indefinite and undefined but is related to two definite or known things”.) She saw mankind as the tertium quid caught between the earth and outer space, changing, shifting bending. Nine years after creating the series, she met and married Astronaut Jerry Carr, whose mission as Commander of Skylab 4 was to explore the effects of long duration space travel upon the human. This exhibit includes the original Tertium Quid paintings and a discussion by Musick and Carr describing how art and science blended into a relationship of caring concern about our environment…how the tertium quid became known and defined. Our Fragile Home, Pat and Jerry’s traveling exhibit about the delicate condition of our planet earth, , continues its journey with a stop at the Alexandria Museum of Art in Alexandria, Louisiana. There is one more venue remaining on a three year schedule. The exhibit is eliciting many wonderful comments. It seems to have an impact on most people. There is great emotion in the space traveler’s description of our home as “fragile and needing nurture…care.” These words generate an expressive response from viewers. It is a very gentle exhibit of the direction we should all be moving – emotionally, intellectually, and socially. Thanks for doing it. I think anyone who visits will be enlightened. Tom Rimkus. Pat and Jerry served as jurors for the 28th September Competition, the Museums 2015 juried art exhibition. They selected fifty works of art and the final prize winners. This exhibit is showing concurrently with Our Fragile Home. 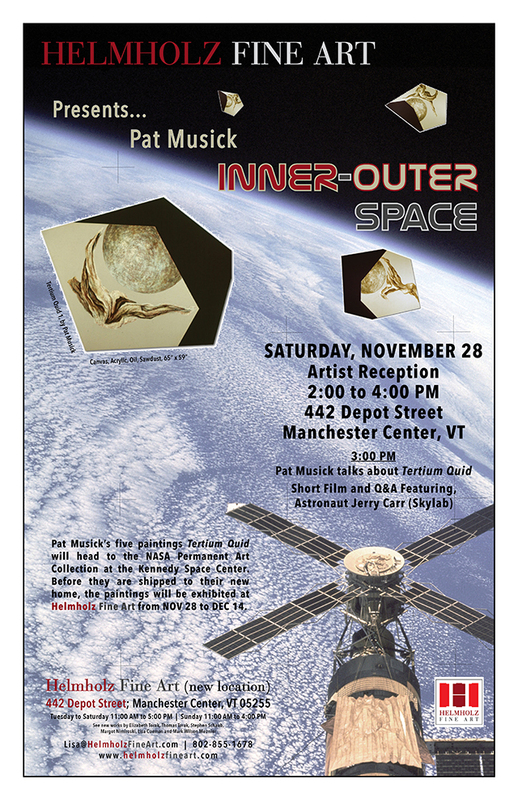 Pat Musick and Jerry Carr are busy preparing to crate and ship a series of five paintings to the NASA Permanent Collection at the Kennedy Space Center in Florida. NASA recently notified them that the paintings, entitled Tertium Quid, had been accepted into the collection. Created in 1970, they reflect Pat’s concern about how mankind would change as we move out to inhabit space. She had been deeply affected by President Kennedy’s determination to reach the moon by the end of the 1960s and by the image of Earthise, taken by the Apollo 8 crew in 1968. The works were created before Musick met and married Jerry Carr, Commander of the Skylab 4 mission whose purpose was to explore how mankind wold adapt to long term life in space. Now the paintings will have a permanent home where nearby rocket pads have launched us into a search for answers about our future. Below are two of the five paintings. 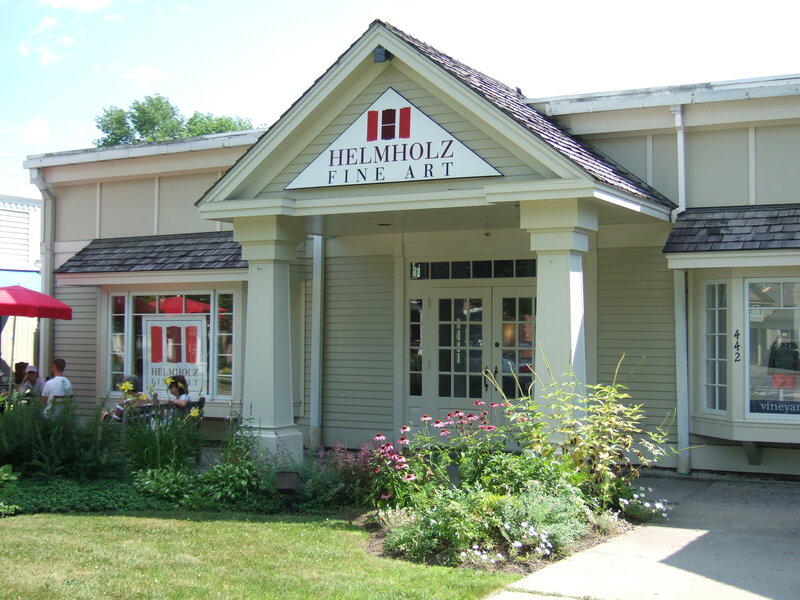 The body of work will be on view at the Helmholz Gallery in Manchester Center, Vermont before they travel to their permanent home.